Brown was a track star who set an Arizona State record in the 100-meter dash while also playing football, where he was a defensive back for three seasons prior to switching to wide receiver in 1982. He caught 19 passes that year, but five of them were for touchdowns as he averaged 20.8 yards-per-catch. Chosen by the Cleveland Browns in the second round of the 1983 NFL draft, Brown delayed his pro football career in order to participate in the 1984 Olympics where he won a gold medal in the 4x100 meter relay event. He joined the Rams, who acquired his rights, for the ’84 season and caught 23 passes for 478 yards (20.8 avg.) and four TDs. Rams went 11-5 to finish first in the NFC West. Won NFC Divisional playoff over Dallas Cowboys (20-0). Lost NFC Championship to Chicago Bears (21-0). 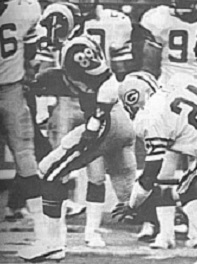 Brown spent the next four seasons on-and-off with the Rams, although he never again approached his 1985 kickoff return average. While having tremendous speed, Brown lacked reliability as a pass receiver and had problems with nagging injuries. He caught 25 passes for 396 yards (15.8 avg.) in 1986 and 26 for 521 yards (20.0 avg.) in ’87, totaling five TDs in what were his most productive pass receiving seasons. Facing protracted problems with negotiating a new contract with the Rams, Brown briefly retired in 1988 but, failing in an Olympic comeback, returned to the club during the season. He played for the Raiders in 1990, where he was shifted to cornerback, before returning to the Rams in ’91, his last year. Overall, as a kickoff returner he averaged 22.6 yards on 199 returns with four touchdowns. His pass receiving totals, all with the Rams, were 98 catches for 1791 yards (18.3 avg.) and 13 TDs. The 1985 season remained the only one in which he received All-Pro and Pro Bowl recognition.